When Zalmi Duchman has a company bill to pay, he pulls out one of his three small-business credit cards. The founder and CEO of The Fresh Diet, a Surfside, Fla.-based diet food delivery company, and 20 of his employees rack up about $74,000 a month on various American Express Business Gold, Chase Ink and Capital One Spark cards and earn cash back or travel rewards. A report from the National Federation of Independent Business earlier this year found that 58 percent of business owners surveyed use a business credit card to pay company expenses. The Nilson Report, which covers the consumer payment services industry, estimates 11 million small-business credit card accounts have been opened in the U.S. and that they accounted for $155 billion of purchases in 2010. They enjoy such latitude because small-business cards aren’t regulated by the 2010 Credit Card Accountability, Responsibility, and Disclosure (CARD) Act, which limits interest rate increases and fees on consumer credit cards. 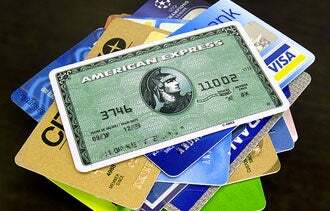 A May 2011 report from the Pew Health Group’s Safe Credit Card Project warns that cards marketed for business or commercial use can result in hundreds or thousands of dollars in unexpected costs in higher fees and rates. Some small-business card issuers have decided to voluntarily adhere to various CARD Act regulations. But most have not adopted the more important protections, such as the prohibition on arbitrary interest rates, excessive fees and universal default. Under universal default, the interest rate increases if your credit bureau reports a late payment to any other creditor, even if you have paid your small-business card account on time. Banks can always decide to opt out of all CARD Act regulations, Papadimitriou says. Account holders are typically notified in advance of changes and have the opportunity to avoid them by paying off balances and closing accounts. But the rewards can be worth the risk, especially if you pay off your balance every month, says Beverly Blair Harzog, credit card expert at Credit.com, a San Francisco-based credit information website. Enticements could include travel incentives, such as hotel or airline points and no foreign transaction fees; cash-back rewards that return a percentage of purchases as a rebate to cardholders; management tools, such as expense tracking and spending limits on employee cards; and sign-up bonuses for opening the account. Last year alone, Duchman of The Fresh Diet says his company earned about $10,000 in cash-back rewards and about 30 round-trip airline tickets. 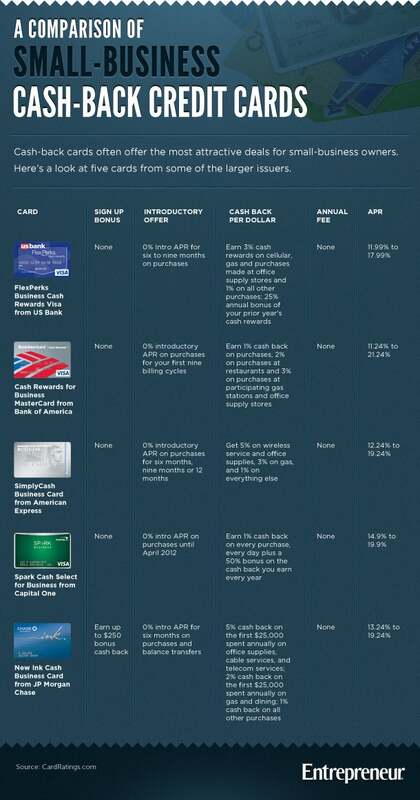 Card issuers often offer a suite of products with different benefits. Businesses heavily populated with road warriors may find big payoffs in hotel and airline benefits, Harzog says, while those making large purchases on credit cards may be better off with cash-back rewards. Finding a competitive interest rate is always important, but don’t count on a low introductory rate lasting long, says Papadimitriou. Be sure to read the fine print and understand how rates could change. Harzog also notes that unless a company has a considerable credit history, small business cards usually are issued to the business owner and often require a personal credit score of at least 720 out of a possible 850. That means the owner’s personal and business credit histories are at risk. Most card issuers report late payments to both business credit bureaus and personal credit report agencies. Risk to a business owner’s personal credit rating increases if cards also are issued to the company’s employees. While spending limits can mitigate such risk, it may be wiser to build a solid enough business credit history to qualify for business cards that don’t require a personal guarantee. Harzog notes that a company may have to negotiate such an arrangement and work directly with a bank representative.